When stepping up your Muay Thai training, it’s crucial to have a good pair of Muay Thai shorts. But with the seemingly endless choice of brands and styles available online, it can be difficult to pick the right pair for your needs. So, I’ve put together this definitive guide to take you through all the brands, materials, sizing, and every other aspect that will determine the best Muay Thai shorts for your training. I will now run you through some of the most popular brands for Muay Thai shorts, and some of their best offerings. There is a good mixture of Thai and western brands in this list. Fairtex are arguably the best known brand in Muay Thai, having been training pro fighters and producing gear and equipment since the 50’s. If you are looking for high quality Thai craftmanship in a range of modern and traditional designs, Fairext certainly provide it. Do expect to pay towards the top end of the price range though. Lumpinee is a huge name in the sport of Muay Thai because the Lumpinee stadium is one of the biggest stadiums in Thailand, hosting the best fights all year round. Lumpinee make very traditional style shorts which you will often see the well known Thai fighters wearing. Sizes come up small, so you are best buying one size up if you are UK or US based. Be aware that many online stockists will ship directly from Thailand which can obviously delay delivery times. Venum are a western MMA gear brand, but the quality of their shorts certainly matches that of the Thai brands. They don’t offer the old-school traditional Thai designs, but instead go for a more modern look with lots of bright colours available. Sizing is the same as most western clothing. RDX are a British brand who make a wide range of martials arts clothing and training gear. Their shorts are of a similar quality to the Thai brands but tend to come at a slightly cheaper price. Their designs are similar to the traditional Thai designs but with a modern twist. 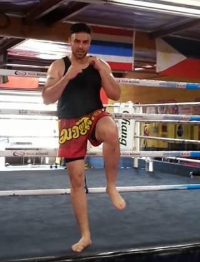 If you are looking to pick up a cheap pair of Muay Thai shorts, and aren’t too fussed about the quality or design then I would suggest going with Farabi or Islero. They may not be the best looking pair of shorts around, and some people find them a bit too long to throw high kicks in, but they will get the job done. Buying shorts is not like buying gloves or shin guards where you must have high quality in order to protect yourself and training partners – you can get away with having a budget pair of shorts if you need to. Do you really need Muay Thai shorts? I think that if you are training Muay Thai regularly, then you probably do. If you’ve been training Muay Thai for any length of time, you will know that kicking pads and sparring requires lots of flexibility in the legs – especially when throwing those high kicks in. Muay Thai shorts are very short and flare out wide of the legs, which gives you plenty of room and comfort to throw kicks and knees. Most average gym shorts are too long and restrictive for Muay Thai training, so will you put you at a disadvantage – especially in sparring. If you’ve been training for a while and want to show you are serious about Muay Thai, donning a proper pair of shorts is a great way to make sure you fit in – you certainly won’t see any of the better fighters at your gym wearing casual sports shorts. Some gyms even make Muay Thai shorts a mandatory requirement if you’re looking to sign up long term. One thing that can be surprisingly challenging when buying a pair of Muay Thai shorts, is picking the right size to fit you. For example, a Large pair of shorts with one brand might be a 32inch waist, but a Large size in a different brand could be a 28inch waist. So, you need to be very careful when buying online and always check the size charts – or even ask the vendor if it’s not clear on the product advert. Generally Thai brand shorts (such as Fairtex and Twins) tend to come up smaller than the Western brand shorts. Most people find they have to buy one or two sizes up when they buy from a Thai brand. Muay Thai shorts will usually be made from either Satin or Nylon. Both are fit for purpose, but satin is the higher quality material. It looks better, lasts longer, and is more durable than Nylon. Nylon shorts will be a bit cheaper, but they won’t last as long as satin pairs. Ideally you will want a pair of Muay Thai shorts with a nice thick waist band, that has a few rows of elastic in it. Thick waistbands ensure that shorts stay in place without being uncomfortable. The best thing about Muay Thai shorts is the array of styles and colours available. You can go loud and colourful like theses shorts. Or you can opt to keep it simple like these designs. I personally like to make sure I have a pair that nobody else in my gym owns. How much to pay for Muay Thai shorts? The price you pay for Muay Thai shorts will differ depending on the quality, brand and style. In order to get a long shelf life from your shorts, I would advise washing them straight after every training session. Leaving your sweaty shorts to fester in your gym bag for days can sometimes cause a stench that washing won’t even shift. Also, don’t train in shorts that haven’t been washed from a previous training session – the smell will not make you a popular training partner. I would advise having a 2 or more pairs of shorts so that you always have shorts to train in when other pairs are in the wash. Which are the best Muay Thai shorts for you? Picking the best Muay Thai shorts is very much down to your own style preferences. Whether you decide to go loud and traditional, or modern and plain, make sure you get a decent quality pair and the fit is correct.